» Hawaii schools changing the way they teach P.E. Dr. Stephen Bradley said he had just seen a 25-year-old Waianae man who weighs 698 pounds, and the man's family didn't think his weight was much of a problem. He said the man's weight is the result of a genetic predisposition toward obesity, a lifetime of habits and what Yale nutrition and obesity expert Kelly Bronwell calls a "toxic environment" foodwise. Bradley is among community health leaders working with state officials and legislators to attack Hawaii's growing rate of obese and overweight children and increased chronic diseases among youth. Gastric bypass surgery is probably the ultimate option for his 25-year-old patient, Bradley said in an interview. But first, he said he's advocating lifestyle changes, which would be necessary even after surgery. Bradley is associate medical director at the Waianae Coast Comprehensive Health Center and he said he's the state's only board-certified bariatric medicine specialist (treatment of obesity). He said he sees the obesity epidemic mostly in adults but it's multiplying in children and associated with a steep rise nationally in Type 2 diabetes. Once considered an adult disease, it's now occurring in 10- and 11-year-olds, resulting in complicated health problems and soaring costs, he said. "We have to start dealing in a preventive mode with the kids." The American Heart Association, in a rare "scientific statement" last week, looked at skyrocketing obesity rates across the nation was linked to reduced physical education in schools. While noting schools are under heavy pressure from the No Child Left Behind Act to raise student test scores, the AHA called on schools to take a leading role in providing daily physical activity and promoting "behaviors that will prevent the development of overweight." Russell R. Pate, a University of South Carolina professor of exercise science who chaired the writing group, said in a news release, "It doesn't mean backing down on academics -- it's not an either/or thing. A balanced academic program should include P.E. and should also incorporate strategies to increase physical activity throughout the school day." Hawaii ranked as one of the 11 worst states in meeting P.E. requirements for schools, according to the "Shape of the Nation Report: Status of Physical Education in the USA." The report, released in May, said no state met the requirements. Today's youth could be the first generation that won't outlive their parents, said Don Weisman, communications and marketing/government affairs director for the American Heart Association of Hawaii. It's a societal problem resulting in high health costs and safety issues, he said, pointing out that firefighters, police officers and the military already are having trouble finding recruits who can pass physical requirements. A long-term goal should be to have a certified P.E. instructor in every Hawaii school, he said, noting there is now "one for every 1,400 kids in public school. It's embarrassing." Physical education no longer is just athletics, Weisman emphasized, "but education to help school kids stay healthy all their lives." Many children are already overweight when they enter kindergarten and "habits get worse as children get older," state health officials said at a recent meeting with state legislators on children's health problems and possible solutions. Concerned teachers, youth and health group representatives also attended the Keiki Caucus brainstorming session. They discussed ways to encourage children to eat healthier foods at home and in school and to get their bodies moving. Ideas ranged from developing "walkable communities" to activities such as the Parks and Recreation Department's "Get In-Motion" program at Farrington High School. Reid Tamashiro said the Farrington program began as a pilot project last year to provide free activities for students and adults because of the area's shortage of land and facilities. Participants totaled about 700 last year and more are expected when the program reopens Sept. 5 with classes in circuit training, hip hop, body fitness, exercise, salsa and cha-cha-cha, he said. Clayton Fujie, deputy superintendent of Hawaii's public schools, noted that a Hawaii teacher was honored as national P.E. teacher in May. Gregg Agena then worked at Mililani Middle School and is now at McKinley High School. "There are good things out there happening," Fujie said. But he cautioned, "You don't want to prescribe one program for every school. All are doing different things but they have to meet standards (for physical education)." Weisman cited a number of national developments to foster healthy lifestyles among youth. » The American Heart Association and the William J. Clinton Foundation formed an Alliance for a Healthier Generation funded with $8 million from the Robert Wood Johnson Foundation for a Healthy Schools Program. Schools can apply for the program, which will provide resources on good nutrition and appropriate physical activity for children and materials to support staff wellness programs. » Nickelodeon has partnered with the alliance for a "Let's Just Play Go Healthy Challenge," inviting kids across the country to take the lead in making their generation the healthiest. Four kids with diverse challenges to make their lives healthier have been followed since April to monitor their progress. More than Hawaii 500 kids have signed up for the challenge and the goal is 1,000, Weisman said. On Sept. 30, Nickelodeon will go off the air for three hours for its third annual Worldwide Day of Play, encouraging kids to go outside and play. » The National Football League has joined with the AHA to launch a program in October called "What Moves U." Kits were developed to help teachers integrate physical activities into existing lesson plans. Teachers can download the kit on www.whatmovesu.com after the program starts. 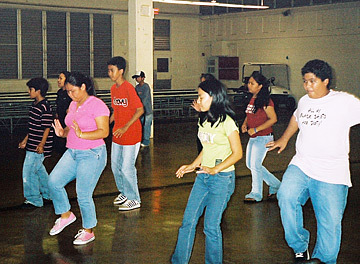 Students danced in a hip-hop class at Farrington High School last year. Hawaii schools changing the way they teach P.E. Public schools are changing the way they do things in physical education, says Donna Ede, educational specialist for health and physical education. Performance standards for physical education have been in revision the last two years and are being implemented this year, she said. "They scaffold on the child's knowledge and skills. They're all focused on (the child) being able to take part in physical activity for a lifetime." The K-12 P.E. performance standards say they "focus on developing a student who feels comfortable as a mover, knows where to look for community resources and believes in the importance of living an active lifestyle." School intramural activities now center around team sports, which will continue, but more individual and lifetime activities must be offered, Ede said. "Research shows there is a big difference between just physical activity and physical education and people often get them confused," she said. "And they often get athletics confused with P.E. "Physical education is the pathway to lifelong physical activity and the health-related components of fitness." Ede said changes in Hawaii's system began five years ago and for three years "we were getting the message out to our teachers that it's not business as usual. We need to change not only what we're teaching, but how we're teaching." Kids are brought up with computers, she pointed out, "and people who teach them have to understand that and develop those skills. Technology is huge in physical education." EVERY HIGH SCHOOL and middle school has a certified physical education teacher, but there are no specialists at the elementary schools. Classroom teachers teach P.E. in the elementary schools. The DOE offers professional development in standards-based physical education for all teachers, Ede said. Two mandatory workshops are scheduled next week for elementary and secondary teachers explaining what the P.E. standards are, what the benchmarks call for students to do, what assessment will show that the student met the benchmarks and how to judge the level of proficiency, Ede said. "What is met in one physical education class in Kahala isn't met at another physical education class at Waianae Elementary. This is a whole systems change and we need to get the teachers on board." The DOE has eight district resource teachers statewide, funded by the Healthy Hawaii Initiative through the state's tobacco settlement fund, and two state resource teachers, one for health and the other for physical education. The resource teachers facilitate Saturday workshops and other training sessions and large health and physical education conferences are held that showcase promising practices, Ede said. They're attended by 500 to 600 public and private school teachers, she said. "We're giving them new knowledge and new skills and activities, such as Pilates and yoga, and the teachers facilitate learning of students," she said. "We have to have confidence the vision is right for all students, not just the physically gifted, and we have to rally behind our educators and encourage and support their change. It's not easy; they have a lot on their plate, but it's for the greater good," she said.